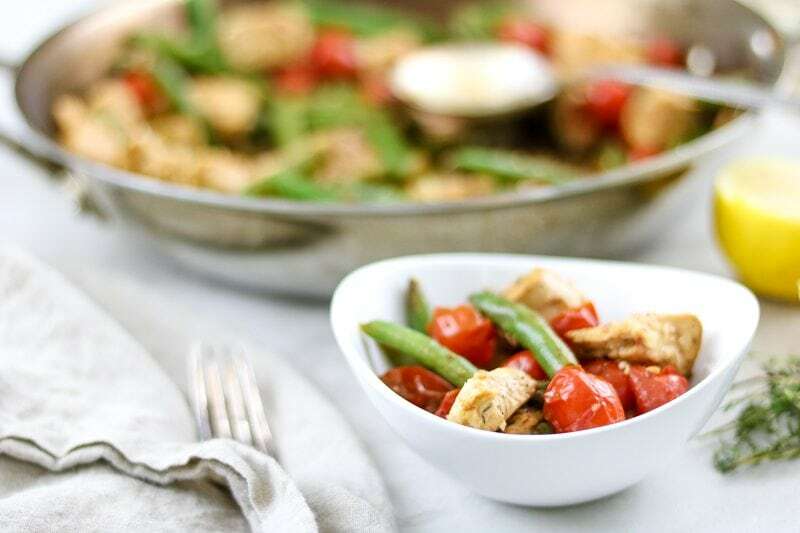 Skillet Chicken with Green Beans and Tomatoes: Tender chicken breasts are sauteed with crisp-tender green beans and sweet bursted tomatoes in an easy, garlic lemon pan sauce. In less than 20 minutes, this one pan chicken dinner can be on your table! Gluten free. Paleo. Whole 30 approved. Low Carb. Can you ever have enough easy family dinners? In my book, as long as we keep eating, I need all the easy dinner recipes to keep coming! Bonus is if dinner can be made in one pan, like Chicken Poppyseed Casserole and Tuscan Pork Skillet, and even better if they are on the table in less than 30 minutes, like Healthy Hamburger Helper and Chicken and Bok Choy Stir Fry. 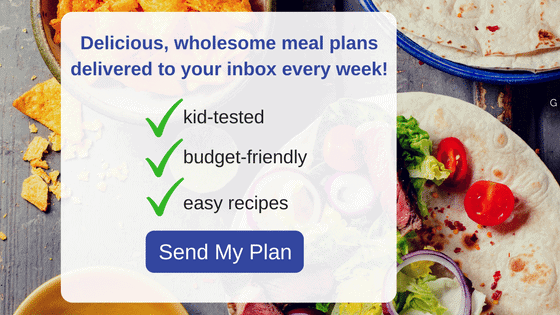 If you are like me (which I bet you are) you need to bookmark my Healthy 30 Minute Family Meals, so that dinner inspiration is only a click away. And in case you are gluten-free, no worries! 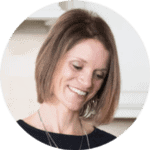 I have a collection of Gluten Free Healthy 30 Minute Family Meals as well. 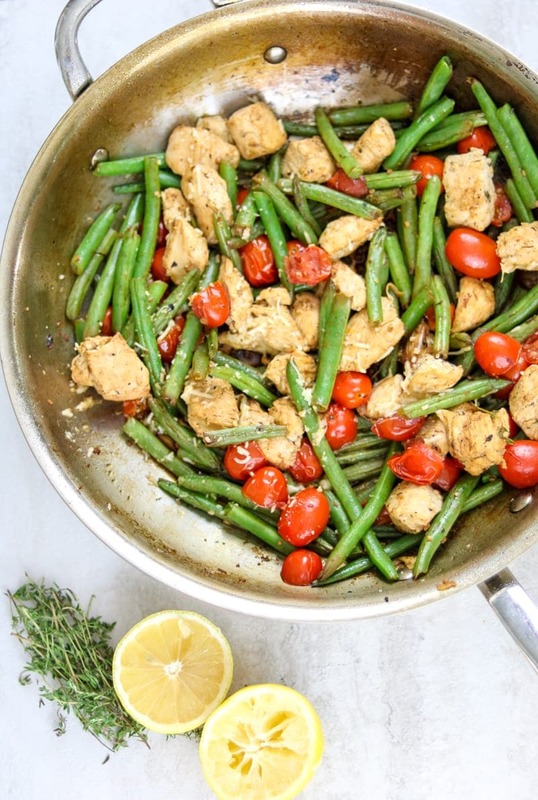 My latest skillet meal is this one pan garlic lemon chicken with green beans and tomatoes. As most of my meal inspiration starts, this chicken dinner was inspired by what I had in my kitchen that needed to be used. I had purchased a large pack of cherry tomatoes to make Tortellini Broth bowls and green beans for my Sweet and Spicy Green Beans. I always have chicken on hand for quick protein sources and happened to have some leftover thyme from Slow Cooker Chicken Thighs. After a busy day, I threw these ingredients together in one pan, and a healthy delicious dinner was done in less than 20 minutes!! YAY! Adding lots of fresh garlic to this easy chicken skillet. Using fresh thyme in place of dried thyme, for a delicate flavor that dosen’t overtake the dish. Finish this easy one pan chicken dinner with a squeeze of fresh lemon juice to add brightness and marry the garlic and thyme flavors together. I also add in a bit of balsamic vinegar for another bright note in flavor. 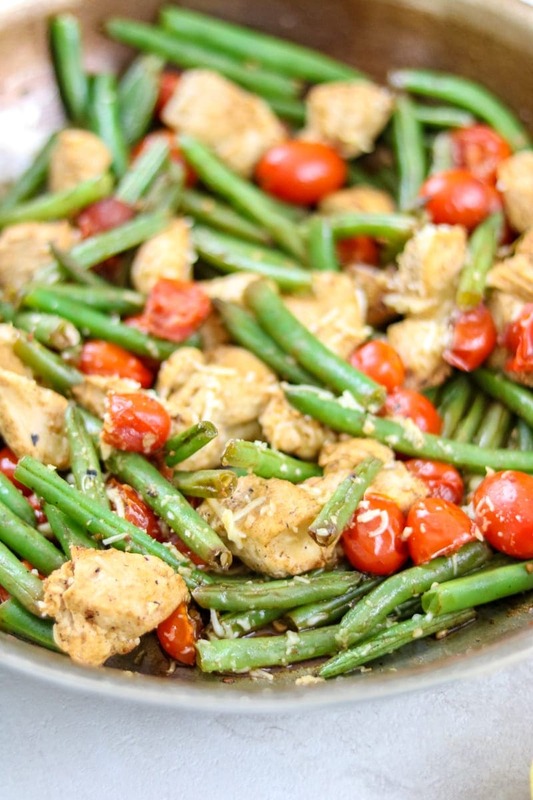 If you are not paleo or whole 30, finish the green bean and chicken skillet recipe with freshly grated parmesan cheese. To keep the green beans crisp-tender, I recommend blanching them first. This can be done by bringing a pot of salted water to a boil and dropping green beans into the boiling water for 2 minutes. Remove green beans and place in an ice bath to stop the cooking process. If you don’t want to take the time to blanch the green beans first, just place them in a microwave safe bowl with 1 tablespoon of water. Cover with plastic wrap and microwave for 3-4 minutes. You can skip the step of steaming or blanching your green beans first, they will just be crunchier in the skillet. If you don’t have fresh green beans, you can substitute thin frozen green beans that have been defrosted. For this recipe, I would not use canned green beans, or cut thick frozen beans. Fresh is best, but the thinner frozen beans will work in a pinch. Cherry tomatoes, grape tomatoes or even seeded, diced roma tomatoes will work. If I am making this dish in the winter months, I find grape tomatoes are best for flavor profile. If you don’t have fresh thyme, leave out the thyme altogether or substitute 1 teaspoon dried thyme. Be careful not to burn the garlic when cooking, or your chicken dinner will have a bitter taste to it, this is why I add it in with the green beans and tomatoes and only saute without adding liquid for a couple minutes. If you don’t have fresh lemons, do NOT substitute jarred lemon juice. Instead add an extra teaspoon of balsamic to round the flavor out. One pan chicken dinner made with lemon, garlic and fresh thyme. Paleo. Gluten-Free. Whole 30. Low Carb. Season chicken with 1/2 teaspoon salt and 1/2 teaspoon pepper. Add chicken to skillet and brown on each side--about 2 minutes per side. Add garlic, green beans, and tomatoes to skillet and saute for 1-2 minutes. Add in chicken broth, zest of lemon, thyme sprig and balsamic vinegar and cover skillet. Let cook about 5 minutes or until chicken is cooked through. Right before serving, remove thyme sprig, squeeze with fresh lemon juice, and sprinkle with Parmesan if using. To keep the green beans crisp-tender, I recommend blanching them first. This can be done by bringing a pot of salted water to a boil and dropping green beans into the boiling water for 2 minutes. Remove green beans and place in an ice bath to stop the cooking process and drain before adding to skillet. If you don't want to take the time to blanch the green beans first, just place them in a microwave safe bowl with 1 tablespoon of water. Cover with plastic wrap and microwave for 3-4 minutes. You can skip the step of steaming or blanching your green beans first, they will just be crunchier in the skillet. The fresh thyme is not necessary, but does had a nice flavor. Oooh, so delicious, healthy, and quick! You’re so right that you can never have enough easy dinner ideas. This is just up our alley. I love easy one skillet chicken dinners. Love anything with cherry tomatoes, too – I find they make a kind of sauce when cooked. Yummy! This delicious skillet chicken is just as quick and easy to make as described, and tastes twice as good! 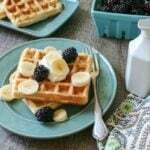 This yummy recipe’s a keeper! FYI the instructions don’t include the thyme! I ended up forgetting to add it because it wasn’t spelled out (I assume it goes in with the broth and the garlic etc). Oh Heather, thanks for the heads up–yes, this was an oversight on my part. I am fixing right now. And you were correct, the thyme goes in with the broth. I hope you still enjoyed! This was really delicious! I would definitely recommend this recipe!! My only question is – how do you know how many grams each serving is? Hi Joyce! I typically do not calculate grams per serving. I base each serving off about 4 ounces chicken and 1 1/2 cup veggies. Hope that helps you! And I am glad you enjoyed! Is one chicken breast correct or is that supposed to be 1 lb? Oh my goodness, that is supposed to be 1 pound!! Changing now!